End view of the custom drilling machine. The orange frame is the transversing drillhead driven by the Nexen Roller Pinion System at base of machine. Notice the level of aluminium debris on the floor of the machine. (Photo credit: Lumco Manufacturing). Motion control application challenge: how to integrate a single servo axis into a high-speed, high-capacity custom rotobroacher. Lumco Manufacturing Company is a Michigan-based company that designs, builds and integrates automation and special machine equipment for the automotive, agricultural, gas and oil, energy and aerospace industries. 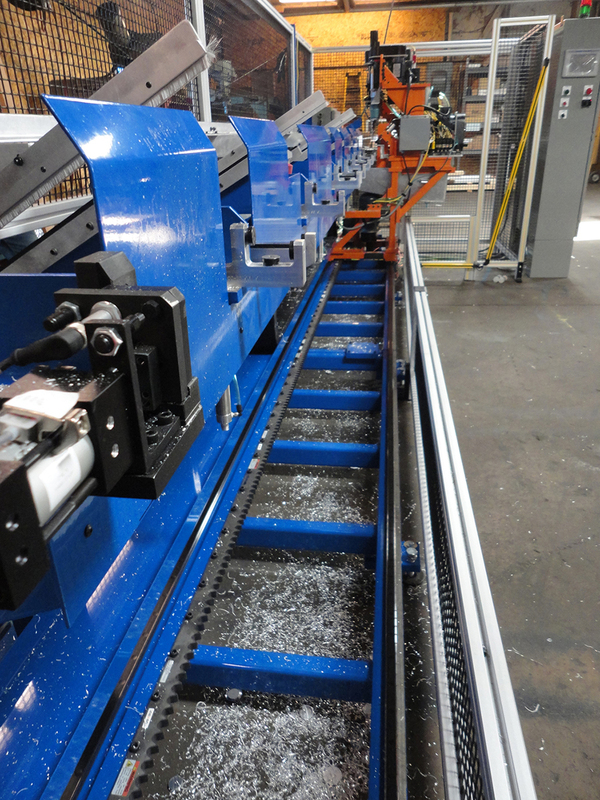 Recently, Lumco custom-built a single-spindle multi-station aluminium drilling and rotobroaching machine to be used to manufacture components of a construction industry aluminium brake. The machine is programmed to handle 21 part configurations with part lengths ranging from 2,2 m to 4,4 m (7 ft. 3 in. to 14 ft. 6 in. ), with a manual load/auto unload. 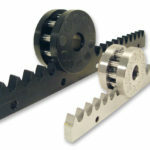 Lumco engineers were looking for a way to incorporate a single servo axis that could handle ca. 4,9 m (16 ft.) of travel at speeds of up to 0,6 m/s (2 ft. per second), and operate in an environment contaminated by aluminium chips. Their options came down to a traditional ball screw arrangement, belt drive actuation, or standard rack and pinion. Ball screw was ruled out due to the length of travel needed, belt drive was ruled out due to lack of accuracy. Standard rack and pinion could handle the distance and speed, but the associated backlash and wear eventually ruled it out as well. After some research, Lumco tapped Nexen Group, Inc. for help. Nexen recommended its RPS roller pinion system, which offered higher speeds, higher accuracy, lower backlash and predictable life. Working together, they factored in the speed, weight and forces of the application to select the correct components to meet the customer’s cycle time requirements. Once projected life and system accuracy were calculated, Lumco determined the RPS roller pinion was their most viable option. “We were struggling to use our traditional ball screw solution on this long of a machine. The Nexen RPS offered the accuracy, speed and low backlash for the long transfer this system required”, said Mike Morris, President of Lumco. Nexen worked on-site at Lumco to ensure that they had the correct data and design parameters to properly size the system. 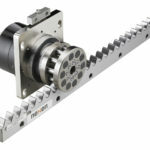 The biggest challenge was incorporating the RPS rack into the design for ballscrew mounting. Once aligned correctly, the rest of the assembly went quickly and the system ran smoothly from day one. Nexen Roller Pinion Systems RPS (Photo credit: Nexen Group). Nexen Roller Pinion Systems RPS in stainless steel (Photo credit: Nexen Group). Nexen produces roller pinion systems, industrial brakes, clutches, torque limiters, overload protection devices and control systems. The company holds 120 US and international patents. 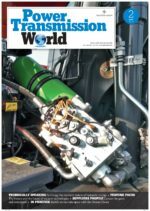 Headquartered in the USA and with the European office based in Wemmel, Belgium, Nexen products are available from over 40 sales offices and more than 1,500 distributor outlets worldwide. Nexen solution are also available on the Italian market by Scala Spa.